Travelers are voting Federal University of Rio de Janeiro as the best university in Rio de Janeiro. There is 1 university in Nova Lima a city just 434 km from Rio de Janeiro. The most popular of these is Federal University Of Minas Gerais in Nova Lima. You can find 1 university in Rio de Janeiro NCR and 8 universities in the country of Brazil. 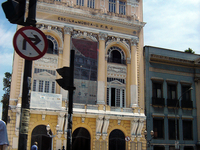 Federal University of Rio de Janeiro is the top pick in Brazil. Want more? Check out our map of universities in Rio de Janeiro.